STILLWATER, Okla. (AP) It could have been a nightmare scenario for Oklahoma State when starting running back Justice Hill left the game with an injury early in the first quarter on the road against West Virginia. Hill exited after gaining 42 yards on two carries, and freshman backup J.D. King stepped up in his place. King wound up setting career highs with 36 rushes and 142 yards, including a 20-yard touchdown run that gave the No. 11 Cowboys (7-1, 4-1 Big 12) a 23-3 lead in the second quarter en route to a 50-39 victory. King also had a personal-best five receptions for 29 yards and another touchdown, a 6-yard catch early in the third quarter that put his team ahead 30-10. They were his first career receptions. 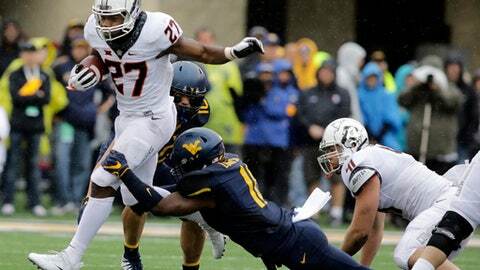 Hill had averaged 25.5 carries over the previous four games, surpassing 100 yards rushing in each of them. King did gain 95 yards on six rushes, and his first touchdown, in the Cowboys’ season-opening win over Tulsa on Aug. 31, but he has served as Hill’s primary backup all year. He had just one carry, for seven yards, on Sept. 23 in a 44-31 loss to TCU and ran it just twice, for 12 yards, in a 41-34 win at Texas Tech. But when the Cowboys needed him most on Saturday, the 5-11, 205-pound King delivered. Gundy said he wasn’t completely sure in August how much King would be able to contribute this season as a true freshman, just one year removed from high school ball in Fitzgerald, Georgia. Hill returned from his injury in the fourth quarter and played well, ending up with 86 yards and two touchdowns on 12 rushes. There doesn’t appear to be any issues with his availability going forward. Even though Hill will continue to get the bulk of the carries, expect to see King on Saturday when the Cowboys host No. 8 Oklahoma in the annual rivalry game.